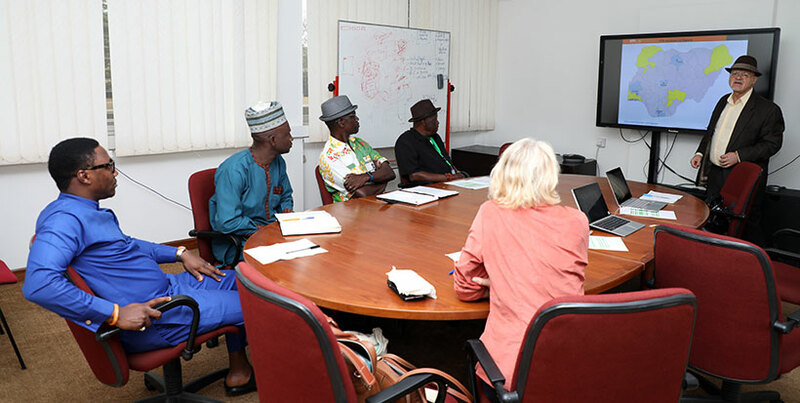 A delegation from the United Nations World Food Programme (WFP) in Nigeria visited IITA on 8 February, to strengthen existing collaboration and synergize ways to improve and sustain the livelihoods of people in the priority states benefiting from the Nigeria Zero Hunger Forum (NZHF). The NZHF is chaired by His Excellency, Former President of Nigeria, Chief Olusegun Obasanjo. IITA Deputy Director General, Partnerships for Delivery, Kenton Dashiell, giving a presentation. The three-member team led by Myrta Kaulard, WFP Country Director, accompanied by Akeem Ajibola, Safety Nets and Livelihoods Officer; and Tundji Sonoiki, Vulnerability Assessment and Mapping Officer, was received by the Deputy Director General, Partnerships for Delivery, Kenton Dashiell; and the Director of the Development and Delivery Office, Alfred Dixon. The goals of the NZHF not only include the elimination of hunger among Nigerians but improvement in their standard of living through an implementable agenda and network of agricultural programs and activities. 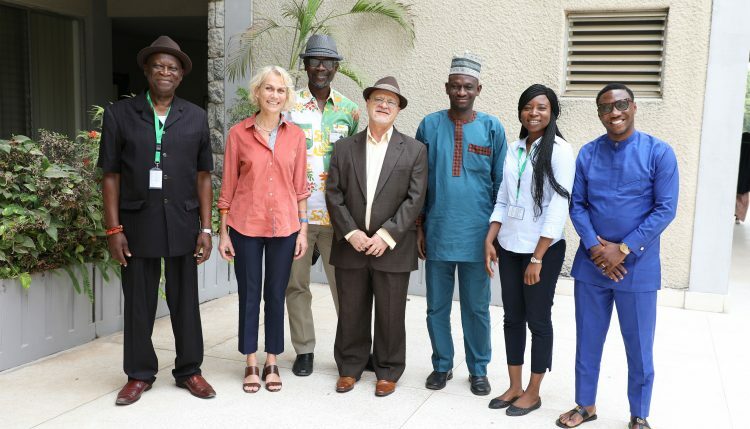 “Working substantially together with an institution like IITA to succeed in our target of ending hunger and poverty across the entire country is fundamental and key to ensuring a better livelihood and creating an enabling environment for all,” Kaulard stated. The visit of the WFP team and collaboration with IITA would further consolidate the gains achieved by the NZHF in Nigeria since it started in 2017. Dashiell further commended the work of WFP in Nigeria and the collaboration between the two institutions. “As the NZHF pledges to end hidden hunger, achieve food security, improve nutrition, and sustainable agriculture, I am optimistic that the mutual partnership between IITA and WFP would contribute to a greater attainment of our mission, which is to help the most vulnerable people to get out of poverty and malnutrition and move into prosperity and good health,” he said.